If you want to learn what it takes to create the “best back workout”, then you need to read this article. I used to be like most other gym-goers; focus on training the muscles everyone CAN see and neglect the ones they can’t. We spend all our time focusing on the chest, shoulders, and biceps yet we tend to neglect the back and legs as a result. And aside from just not taking their back workout seriously, most people end up choosing the wrong combination of exercises. This is a huge mistake since well-developed and proportionate back muscles contribute A LOT to an aesthetic physique. Luckily, I realized this and finally started putting more thought and effort into my back workouts. It was only once I started incorporating the evidence-based exercises you’ll see in this article that I started noticing significant improvements. Although I still have a ways to go, I think it’s safe to say that I’ve done a decent job of developing my (once lagging) back musculature. So what exactly are the best back exercises to include in your routine? Well, let’s first take a look at what exactly we’d want to accomplish with these exercises. As you can see, there are also a few smaller muscles that serve an important role such as the teres major/minor and the infraspinatus. We want to focus on these muscles as well as they will strengthen our shoulder through stabilization and also help provide an aesthetic appeal. These features are EXACTY what creates an attractive looking back. It’s the “secret formula” that nobody tells you about. But how exactly do we achieve these features? Well.. This is where we’ll need to dig deeper and is where we’ll start discussing the best back exercises AND combine it all into the “best back workout” routine. Before we get started on the exercises I want to briefly talk about muscle activation. We know that establishing a strong mind-muscle connection plays an important role in enhancing muscle activation AND muscle growth. It’s something that’s been proven time and time again in the literature. For example, one 2009 study by Snyder et al. found that subjects were able to boost activation of the lats by simply providing incorporating few back-activation cues during the lat pulldown. And one recent 2018 study by Schoenfeld and colleagues showed that focusing on a strong mind-muscle connection with the biceps during arm curls led to almost double the biceps growth when compared to just trying to “get the weight up”. So long story short – focusing on feeling your back work during these exercises is vital. But how exactly do we do this? Easy! We use a few activation cues and various tips/tricks I’ve learned over the years. 1. Think about “pulling” with your elbows as opposed to thinking about pulling with your hands. This applies for all back exercises. 2. Bring your shoulders down and away from your ears to depress/relax your traps before (and during) each exercise. 3. 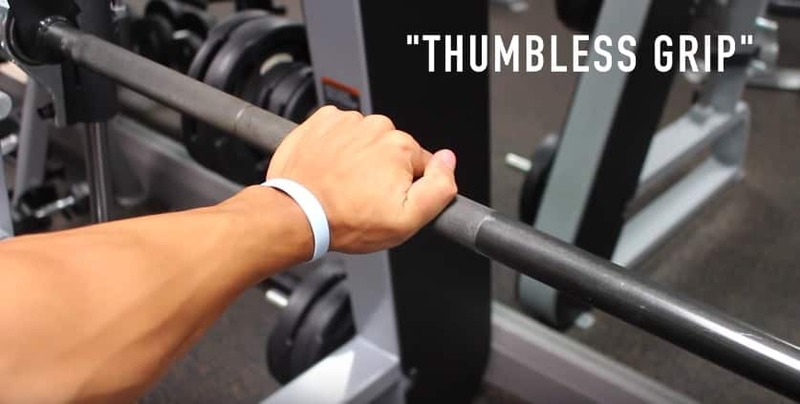 Try utilizing a “thumbless grip” by removing your thumb from underneath the bar/dumbbell/grip and put it over the grip with your fingers. This often works wonders in terms of lessening the involvement of the biceps in the movement and making it easier to feel the back actually working. Using these cues will help you maximally activate and grow the muscles that should be working in the following back exercises. If deadlifts currently aren’t somewhere in your lifting routine, I highly suggest you start doing them. It’s a great compound movement to target virtually all of your upper and lower back muscles. They mainly add thickness to the back by heavily stimulating the trapezius muscles, but will also contribute to growth of the lats since they will be assisting throughout each rep. In addition, the ability to easily overload this exercise and work up to heavy weights with it makes it a no-brainer to include for overall back hypertrophy. And for those wondering, yes they are safe. Numerous studies have shown that not only are deadlifts safe for the back, but they actually seem to prevent back injuries from occurring by strengthening the core musculature. However, the catch is that you must perform them with proper form and avoid excessive rounding/arching of the lower back. Although this is a topic for another article, I strongly advise you do your research into how to properly perform them beforehand. Now in the event that you can’t do deadlifts or would prefer to do them on your legs day, I would opt for using above-the-knee rack pulls here instead. Why? Because it’s the only other exercise that enables you to handle very heavy loads in order to fully stimulate the traps and overall back musculature. And since the range of motion with this exercise is much less than that of a deadlift, it makes it a convenient option for those who struggle with deadlifts due to past injuries. As for how to do them, simply set up a power rack to just above the knees and pull the bar up as you would in a traditional deadlift. The only difference now is the greatly reduced range of motion. This is probably my favourite exercise for several reasons. 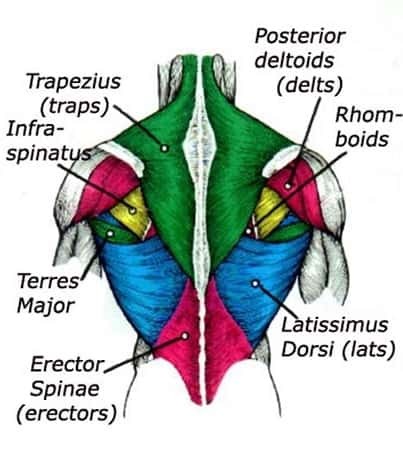 First of all, not only does it work pretty much all of your back musculature like your lats, lower traps, and rhomboids, but they also greatly increase the role of your all-important shoulder and scapular stabilizers like the teres muscles and the infraspinatus. And the fact that it’s a closed chain exercise (meaning that the hands are held at a fixed anchor point) suggests that it may result in greater motor unit recruitment of the back muscles. This has been demonstrated in several studies that compared open-chain exercises like lat pulldowns with closed chain exercises like the pull up. Now as for whether you should do pull-ups or chin-ups, research, tends to show that both pull-ups and chin ups provided equal lat activation. Thus, given that we are focusing on maximizing back growth, pull ups seem like the better option for this reason. However, some may get better overall back activation with chin ups as opposed to pull ups. EMG studies provide us with good insight but doesn’t account for individual variation. So try them both out and see which feels better for you – you can always include both in your workout if you wish. I personally find that a fairly wide (a little wider than shoulder-width) overhand thumbless grip pull up best activates my back. Now as for progressive overload, once you can comfortably perform 10-12 clean reps of a bodyweight pull up, I suggest starting to gradually add weight to the movement. This can be done by using a weight belt or holding a dumbbell between your feet in order to continuously progress this exercise. But if you’re currently unable to do a pull-up, I’d suggest utilizing an assisted pull-up machine and incorporating pull-up “negatives” to build the strength to do bodyweight pull-ups. So I definitely suggest you include a rowing type movement into your back workouts to hit these other muscles. I’d personally suggest using a chest-supported horizontal row in this workout since it minimizes the involvement of the lower back in the movement. This is because research shows that back exercises that involve less lower back involvement often provide better upper back activation. And since your erector spinae has already gotten a good workout from the deadlifts performed earlier, let’s just say that your lower back will thank you! Although the pull-up can definitely be argued as a superior exercise when compared to lat pulldowns, the lat pulldown is an excellent supplemental exercise to use. It targets similar muscles as the pull-up, just with less involvement of the shoulder stabilizers. As for the best variations to perform them, in my opinion overhand middle and wide grip front pulldowns with a slight lean back are likely the best options. Why is this? Well, let’s take a look at the different variables. Front pulldowns have been shown in many studies, such as this one by Barros and colleagues, to be superior in terms of lat activation when compared to other variations like behind-the-neck pulldowns and V-bar pulldowns. Let’s not forget that front pulldowns also don’t place your glenohumeral joint in a compromised position as behind-the-neck pulldowns do, so stick to front pulldowns! I recommend slight lean back during the pulldown based on the conclusions of this study, which demonstrated that “a slight lean back at 135 degrees led to an 11% increase in lat activation as long as no momentum is used.” Thus, a slight lean back is optimal but you don’t want to be swinging every rep! As for hand grip, one study by Lusk and colleagues concluded that a “pronated (overhand) grip had significantly higher lat activation when compared to a supinated (underhand) grip during lat pulldowns“. Which is why I recommend using an overhand grip. And for grip width, this study by Andersen and colleagues examined the activation of various back muscles using 3 different grip widths: narrow, medium, and wide. The researchers concluded that the 3 different grip widths exhibited very similar lat activation. BUT the biceps were most activated with the middle grip AND subjects were able to lift the most weight with the middle grip. So it seems that the middle grip is superior to the other grips as it provides equivalent lat activation but more biceps activation and the ability to lift heavier weight. However, the same study also showed that during the eccentric portion of the movement, the infraspinatus (one of our rotator cuffs) was better activated during the wide grip. And given that a wider grip will also involve more of your teres major muscles due to its anatomical position and function, I think we can conclude that using a combination of both the middle and wide grip is best in terms of back development. This last exercise is something I highly suggest you add into your back training workouts to finish it off. They’re called scapular pull-ups and mainly strengthen your lower traps. This helps with improving your scapular stability and keeping your shoulders healthy. You simply want to hang from a bar, depress your shoulders down and away from your ears and pull your body up without allowing your elbows to bend with a slight pause at the top of the movement. As you get stronger with this exercise you can always progress it by performing more reps, using a slower tempo, or using a weight belt to gradually add weight to the movement. So to wrap this all up, here’s a sample back workout you can do using the 5 exercises I discussed. You want to stick with this routine for a couple months and focus on progressively overloading these exercises. Then once your strength plateaus you can do different variants of the exercise, switch up the order, and so on to keep progressing. And for those wondering “is this back workout for men only”? No! If you’re a female and looking to development a strong looking back, then all of the above information will apply to you as well. A lot of you probably don’t run typical “bro-splits” with a full day dedicated to your back workout. Thus, for those running an upper/lower split or a push/pull/legs routine, I’d suggest incorporating 2-3 of the above back exercises into one of your upper or pull days and incorporate the rest on the other day. If you’re still confused about this, I show an example of how to do so in my upper body workout article. But that’s pretty much it for this article. I hope you all enjoyed it and found it useful. As always, let me know in the comments if you have any questions/concerns I can help you with. And show me your support by giving me a follow on Instagram , Facebook , and Youtube where I’ll be posting informative content on a more regular basis. Cheers! Great article as always brother. It helps me a lot to understand back muscles and workouts. Great information Jeremy! This is very helpful. I’m definitely going to try this. Thank you! Excellent article! Very well written, to the point. I’m that dude that has taken a shotgun approach to my back. Hit every muscle, every work out, every time. Time to take advantage of your insight! Taking your workout onboard as of today. I’ve been following you for some time. I’m almost 58 and have never been in better shape . Thanks to Jeremy and of course my other go to guy Jeff C.
Thanks Greg! Glad you enjoy my content. very much enjoy your articles and the information you provide. Super Helpful! Looking forward to applying these details to my next back routine. Great article, really like the scientific content of what you do, thank you. After having problems with golfers elbow and pain in my brachioradialis muscles, I gave up pull-ups for a while and both have improved tremendously. I can do up to 7 pullups in a set but have decided maybe this is just putting too much strain on these areas. Can you recommend a good alternative to pull-ups or should I start them gradually again now that my problems seem to have resolved? I’m 61 by the way. The “inverted row” is a good substitution for the pull up. to prevent lower back injuries and strengthen lower back. What angle do you recommend to perform the Chest-Supported Rows exercise? i was following you for a while and to be honest i was skeptical from beginning like “another young guy who think knows everything” and i was veeeery far from the true! really likes your videos/topics you cover very deeply and with lot of information from studies which i appreciate. i had lack of back progress for long time . I was able to do max 1-2 push-up despite my chest is able to do sets with 100kg (aprox 200 punds?) so i have implemented your correction routine and your back exercises and it f**ing works man! i am doing scapular pull-ups all the time, inverted rows and reverse curls help me build more strength and now Im able to lift more weights and also pull ups without any help. i will continue to do and i hope one day ill have back as you do (need to drop some fat to be mroe lean of course, but not much) so thanks a lot, keep that good work! Thanks Robert! That’s really great to hear, keep it up! Good article. I have only recently started to weight train and am struggling with pull-ups. I have about 10-15 lbs. of weight left to loose and my back is far from developed. I was wondering if adding as much weight as I can to my lat pull-down would speed up my ability to do pull-ups? 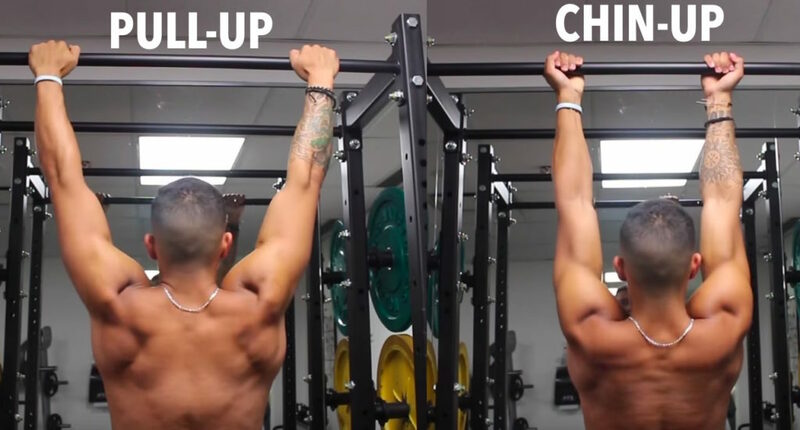 I can see how the pull-up would be a great back developing tool, but it seems that your back has to be well developed before you can even perform the pull-up. I would really appreciate your insights on how to get to that plateau. Thanks for the videos and articles. Keep them coming! Jeremy.. love your article.. and I’ve incorporated the whole exercise in my workout routine.. and do i have to say it.. it’s awesome.. Thank you! Thank you once again Jeremy! All the PDFS that you have shared with us have really helped me & have kept me motivated. Keep on the the great work! hi great page, i use it as my daily routine! just a very very difficult question … may be is linked to this type of exercises…how to reduce love handles? i know everything starts on fat and nutrition but any specific exercise based on research?